To Exceed Expectations once again, Bristol Motor Speedway announces it's incentives for guests who purchase tickets for 2019 Bristol events. 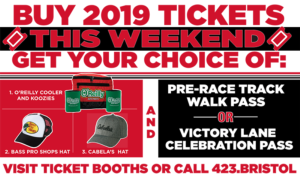 All who purchase or renew 2019 Bristol tickets during the Bass Pro Shops NRA Night Race event week (August 16-18) will receive two (2) additional items, which include great merchandise AND an incredible experience. Campsite spots and Premium experiences are also eligible for rewards if renewed during the weekend. 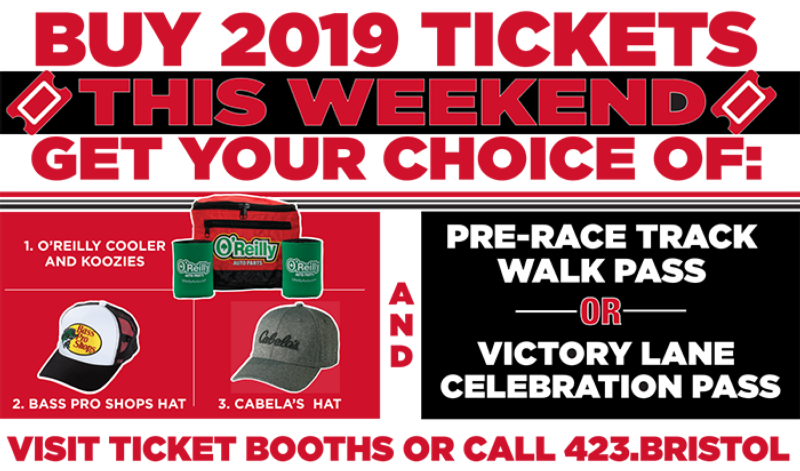 Merchandise options are an Bass Pro Shops Hat, Cabella's Hat -OR- O'Reilly Auto Parts Cooler and Koozies (while supplies last). The Track Walk Pass allows you to walk along Bristol's high banks before the green flag drops, or if you want to be there when the dust settles, celebrate on the track with a visit from the Bass Pro Shops NRA Night Race winner!